En Nihil and Filth are two fantastic power electronics artists. The former has released quite a few albums under the En Nihil moniker, three of them a trilogy series; Filth is Rob Buttrum’s project, the owner of Out-Of-Body Records. Black Earth finds them working together on a split tape of 8 heavy tracks, with En Nihil’s side leaning more towards the rhythmic electronics and Filth’s heading into heavy, vocal-filled territory. First up is En Nihil on Side A, and the first track “Tribes of the Black Ash” is a pounding texture of percussion and swooping electronics, building up to various sizzles, feedback, and the quiet use of vocals more as an instrument than an abrasive lyrical assault. It sets the tone very well, an ambient introduction to En Nihil’s sound that adds quite a bit of sonic variety despite the stoic percussion. “An Infinite Void” sets in directly after, with huge bass and a similar pounding bit of bass drum overlayed with static. Feedback becomes the focal point, not exactly harsh but with a structured tendency. “One Hundred Thousand Years” has that familiar power electronics vibe, an electronics buzz rhythmically repeating along with a power saw whirr; there’s the dips and percussive wallops one would expect from PE, although En Nihil is unwilling to give the expected vocal performance.The side ends with an ambient drone, a buzzing of bassy electronics that envelops the listener, soothing after the burning PE before it. Filth’s first track is “A Horizon,” where pounding percussion intermixes with a crescendo of swirling loops and intense howled vocals, eventually adding what sounds like squeaky tape manipulations. “Beneath the Vertisol” has more of those heavy bass repetitions along with a glitchy electronic loop, which adds in an alarum ring a bit later on in the track and a dreamy ambient interlude. Filth uses vocals in this to create a very creepy tone. It loses that rhythm to a jumble of sounds, including stuttering percussive blasts and various electronic manipulations.”The Hollow Earth” adds an almost dance aesthetic to the sound, at the same time ostracizing casual listeners with a feedback squall and manipulated, degraded vocals. Here Filth builds up from this into a power electronics surge of vocals and repetitive percussion, layering on multiple textures in the process. Finally, “A Silent Scream” ends Black Earth with inhuman howls, a heavy dose of crumbling bass walls, and warped echoes of audio. 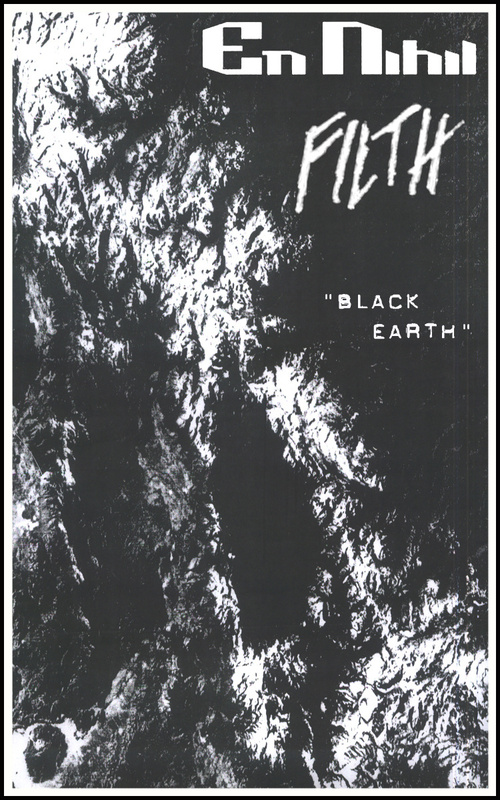 Both En Nihil and Filth bring heavy textures to this split, and Black Earth is a bleak listening experience besides En Nihil’s finale. These projects are some of the best in the power electronics sphere right now, and bringing them together on a split cassette like this means you’re getting an amazing showcase from both artists. En Nihil brings a more traditional PE experience, while Filth tends to add industrial beats; but you can’t go wrong with either side on the torched Black Earth.